"Beautiful as a German Film Diva of the '30's and American power-woman"
"Powerfully and dynamically, Christina Linhardt performed the German and US National Anthems, to clamorous applause." She was contracted to perform her act to open the Grand Concert Hall Parksalle in Dippoldiswalde, Germany, accompanied by Wolfram Tetzner, the conductor for the Dresden Operetta House. (Semper Opera star Christiane Hossfeld opened for them). The following summer Ms. Linhardt was called back to sing for the re-opening of the Palace Ligner along the Elbe river. She represents the city of Berlin every year for the Los Angeles Sister Cities Festival, and sings the national anthems for the German Consulate, joined by Christoph Bull, acclaimed organist and pianist, and violinist Benedikt Bryden. "Classics to Cabaret" incorporates a gamut of genres from operetta, to songs made popular by Marlene Dietrich, to standard Broadway musicals, and art songs and Lieder. 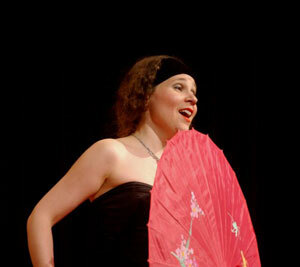 Ms. Linhardt brings her own personal style to the music, by adding theatrical touches, costume changes and choreopgraphy. For musical collaboration, she often works with Nick Ariondo ( the virtuoso accordionist), Robert Thies (the only American since Van Cliburn to win a Russian piano competition), Bryan Pezzone (the consummate cross-over pianist of his generation), and Armen Guzelimian ( pianist to the great opera stars). "Mit Ihrer wundervollen Stimme haben Sie ganz entscheidend zu dem guten Gelingen des Empfangs zum 20. Jahrestag der Deutschen Einheit beigetragen...noch mal ein herzlichen Danke"
"With your wonderful voice you assuredly contributed to the great success of the reception celebrating the 20th anniversary of German Unification ...once again, deepest thanks"
Representing the City of Berlin at The House of Blues Commemorating the Tiananmen Square Protest and Celebrating the liberation of Eastern Europe from the Soviet Superstate.